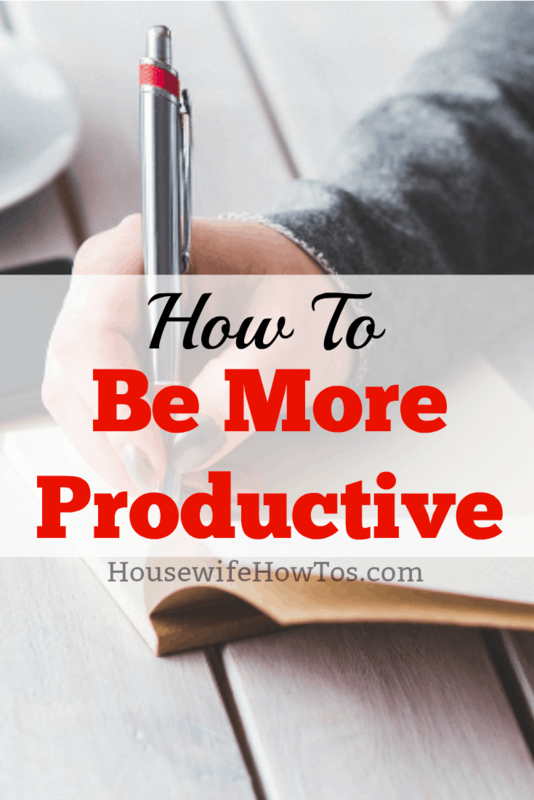 How To Be More Productive: Not just for housewives! Years ago, I spent far too much time researching how to be more productive. So much, that I was practically addicted to information about productivity. I devoured highly-respected books on the subject, bought magazines filled with articles about “having it all,” and frequented some blogs and websites focused on teaching people to do more in less time. I read them hoping to find the key to getting my home perfectly clean and flawlessly organized, then keeping it that way effortlessly. I spent so much time reading about ways to be productive — and adopting the tools the authors were selling (they’re always selling something, aren’t they?) — that I wasn’t accomplishing much else. Meanwhile, the laundry piled up, the furniture turned gray with dust, and the number of things I needed to do grew overwhelming. So I threw up my hands and decided to wing it, hoping that I’d eventually stumble across a system that worked right for me. It took a while, but one day things just started coming together. Since then, I’ve reached a level of productivity in my life that I’m quite happy with: I accomplish the things that matter and which help our home run smoothly, but I also have plenty of time to do other things…or nothing at all. To me, that’s the ultimate goal of productivity: making time to do nothing. But first, I had to reject a few things that the productivity gurus love to preach. In their place, I came up with some of my own solutions, a couple of which seemed contrary to everything I’d learned from all of those productivity “experts.” Here’s what works for me. Around my 40th birthday, I started to have problems falling asleep at night. Oh, I’d start to drift off then unfinished tasks would go racing through my head. Half the time I’d find myself so worried that I couldn’t sleep, so I’d get up and start doing some of those things, instead of just fretting about them. I became an exhausted and grumpy woman. Then a friend suggested I keep a notebook by my bed and start writing down those thoughts. The idea was to empty my mind so I could sleep. Only problem: some nights I’d be awake writing for hours. And I stayed an exhausted and grumpy woman whose bedside was littered with lists. Eventually, I asked my doctor for a prescription sleeping aid. That night before bed, I took a pill, grabbed a notebook, and started making my list but dozed off after I’d only written four or five things. The next morning I woke up to a short list of what had been most on my mind, and I finished the whole thing before lunch. That night after I took my pill, it happened again. And again. Then came the morning when I discovered I’d made a snack for myself while still asleep. Also, I’d left the fridge open, so everything my cats hadn’t helped themselves to was spoiled. I tossed the pills but decided to stick with the process of listing only the four or five things that I most wanted to accomplish the next day. That night I went to sleep almost immediately, medication-free. Same thing the next night, and the one after that. Since then, that’s been my system: to write down only what I want to accomplish the next day and then turn out the light. And that leads me to the next important trick. There are two reasons to make a To-Do list: one of them is to make sure nothing falls through the cracks, but the other is to let you know when you’re done. That, I think, is the most challenging part: feeling like there’s an actual end to work. You clean, then someone drops something, and you’ve got to clean again. You do laundry, but at bedtime, there are more clothes in the hamper. You wash dishes but as soon as someone eats there are more. You could work 24/7/365 (if you didn’t need sleep) and still there would be more to do. Once I realized this, I forced myself to plan just a handful of things. I mean that quite literally: my To-Do list is never more than five items long. 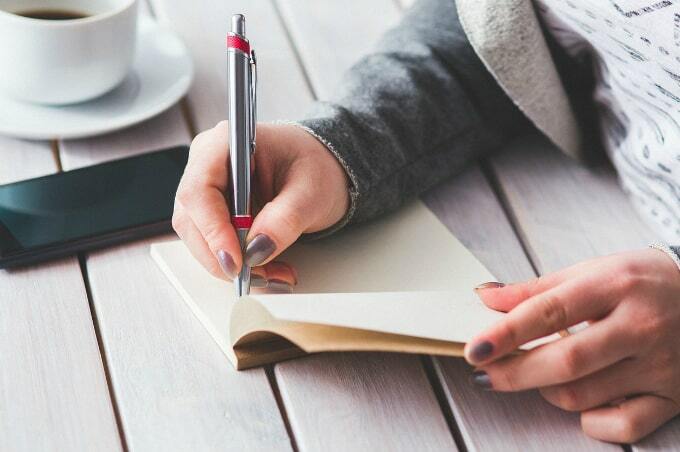 When I start writing my list at bedtime, I sort through all of the possible things I could do the next day and choose the top five priorities. Oh, sure, I may very well accomplish more than five things the next day. In fact, I usually do. By selecting five items out of all the possibilities, I’m focusing my efforts on what matters. I’m also giving myself a defined endpoint, after which I can feel like I’ve spent my day wisely. Except, it’s not really five things because I fudge a little using the next trick. Productivity gurus urge people to accomplish their least favorite task first. This, they explain, makes the rest of your list seem easy in comparison. For me, feeling like I’ve accomplished something spurs me on to wanting to achieve more, so I took that notion and made it part of my day. My list always starts with something ridiculously easy so that I can cross it off right away. Some days it starts with “Take sheets to the laundry room.” Other days it’s even more simple, maybe “Feed the dog and cats” or even “Make coffee.” The important thing is that my list starts with something I can do while I’m still half-asleep and then cross off. By the time I’m really awake, I’ve already got a good start. Also, since I get the satisfaction of crossing something off right away, I get to feel energized by seeing that list get shorter before I’ve used up much of the day. Confession time: I despise cleaning bathrooms. I. Despise. It. That we bought a house with four of them — FOUR! — is undoubtedly some sign of deep psychological trauma on my part. Despite my suggestion, my family won’t let me declare two of them permanently closed, so every week I wind up cleaning all four. Except it took less than 20 minutes to clean the worst bathroom in the house. Uh, really? I’d been dreading something that took only twenty minutes at most?! Since then, I’ve figured out how little time it takes to do some of my other least-favorite chores. Emptying the dishwasher? Four minutes. Sweeping the kitchen floor? Seven. Vacuuming the stairs? Five minutes once I have the vacuum out. Finishing a load of laundry? It takes fewer than twenty minutes to fold/hang clothes straight out of the dryer and put them away. Now, think about it: if your list only involves five things taking 5-20 minutes a piece then at most it takes two hours to get it done. How can we rationalize NOT being productive when it takes such little time? As I mentioned, one of the most challenging things about homemaking is feeling like we’re never, ever entirely done. It’s the same for people who work outside of the home, too, only they have many of the same tasks on top of the work they do elsewhere. That’s why we all need To-Do lists: they tell us when we’re through. Our real challenge: accepting that once we cross off the last item on our list, it’s okay to declare ourselves done for the day. Life shouldn’t be spent cleaning, cooking, organizing or doing laundry every minute of the day. That’s not productivity; it’s drudgery. We should be doing those things to get them out of the way so we can go on to things that are more enjoyable, like reading a good book, soaking in a warm bath, playing with the kids, or just watching the clouds in the sky. So, rather than letting our To-Do lists tell us what work to do, we should use them as tools to tell us when our work is done. And then wad the things up, toss them in the trash, and go about our TRUE business: living well and laughing with those we love. That’s right — there is so much more to life than cleaning. Make time to enjoy your life, too! This is really great! I have read so many books promising to give me the answers but when it comes down to it, only you know what will work right for you. I am doing this already with the to do list. Before I had it I never felt like my day was over, everything seemed to always be floating around my mind. Since I’ve got my list things have become so much better. To be honest I’ve even used it to show my kids and my partner (Look what I’ve done today) just so they can all see all the crap I have to do in one day. Honestly just them seeing my list with all the boring things us housewives/husbands have to do has made them understand why I’m tired at the end of the day and there actually helping me out more. This post is awesome, it made me realise I’m actually putting too much on my list for one day. Today I have 16 things on it (Ouch) no wonder I have a herniated disc! I like what someone said about taking one day off, I never do that, I’m always doing housework, I have the best intention to have some me time once my to do list is all crossed off but as my list is always so long I get to the end of my list and realise the day is almost over. I don’t want to look back in 20 years and only remember keeping our home clean, I want to look back and have so many great memories of doing things I loved, Even if that is writing, reading or yoga (I’ve been meaning to get back into Yoga but never find the time) Thanks for this post, I’m going to cut my list down, so I maybe even find some time for me to have some well deserved me time. Oh, 16 things is definitely too much for a daily To Do list! That just sets you up for feeling guilty, Sarah. If you don’t get everything done on it then you “failed,” right? But if you do get all 16 things done you’ll feel like you didn’t actually get to spend part of your day living your own life. My husband cleans ours, my sons the three other ones. All good at our place. The yellow stuff goes where it needs to. Leah, you’re so right! This summer my son wanted to start earning more pocket money. I came up with a list of chores for him to do which includes cleaning the bathrooms. They stay so much cleaner now! Katie you are great! Thank you so much for your insight. I’m so guilty of trying the productive books and lists and failing at some point. I’m also adult ADD which means I had it as a kid and routines are so far from my lifestyle. I’m trying now to change things as I can see the benefit of routines. Your list makes so much more sense too. And yes, I feel like I’m never done and that is a terrible feeling. When you are never done it is difficult to get to the creative things you want to do. I’m taking your info to heart and I already feel that I have a great chance of being successful this time. Thank you for such a sweet comment, Nikita! My son was diagnosed with ADHD when he was younger but had a bad reaction to several different meds. So, I’ve learned over the years a few “tricks” to work with that. ADD/ADHD brings certain strengths with it — give y’all something clear-cut and interesting to focus on and, wow, there’s no distracting you! So that’s where my flow-chart approach came from initially. Then my husband was diagnosed with brain cancer and went through surgery, chemo and radiation (the chemo will continue for the rest of his life, and he’s doing wonderfully on it). Those bring their own attention challenges, though. So these flow-charts? The harmony in our household depends on them! One thing I’ve learned with both of them, though: give yourself a day — one day — to do nothing. In theory, you just need to plow through until that day. In reality, you’ll probably play catch-up on that day. But that’s okay, because then you get the sweet satisfaction of knowing you DID do it all! Having a notebook is a great way to organize your thoughts instead of counting sheep to get to sleep. What a great idea! I wish I had done such a thing when I was younger. We always found the time to enjoy our children and attend their functions but I would find myself up very early and to bed far too late in order to keep the house to my liking. Now that I am older, my body makes the list for me…LOL, but your advice is great for those just starting out or with children at home.